Used creatively in hitherto unheard of sectors, the Internet of Things (IoT) shows no sign of slowing down especially in the mobile app realm. As never before in time — it’s ubiquitous. You can explore the Android or Apple store all by yourself. Whether it’s about booking a cab or ordering some food, making a purchase — mobile apps are considered no less than a wallet. Speaking about the next big thing in town — sometimes we fail to think big enough with AI and IOT. Not thinking big enough is not due to lack of imagination; it’s because of the pure lack of observation. Determine in your life — to keep the future within sight — so that you don’t have to keep thinking upon what’s coming up next. The rare combination of the Internet of Things and Mobile Apps continues to be hot on our heels these days across the globe. 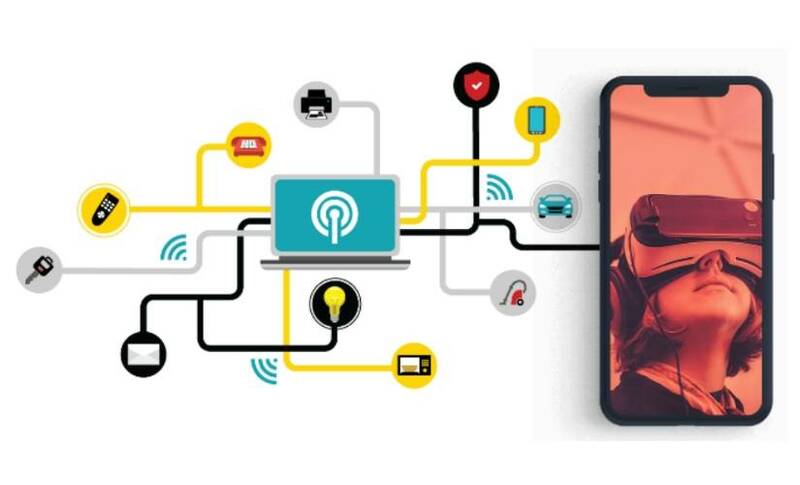 IoT app development is no longer a buzz-word; it means a subsequent demand for mobile apps for such type of devices seems to ride a wave day in day out. Right from energy to healthcare, retail manufacturing, agriculture — endless real-life IoT implementations can be found. In a nutshell, we all seem to be heading towards smart retail, connected cars, wearable devices, smart cities, etc. Physical devices connected to the internet and the usage of smartphones seems to gain popularity in no time. It may quite interest you to know that one can have complete control over their features that are offered by these gadgets. Here are some specific points that emphasize on why there is a need for AI and IoT. #1 Offers personalized experience to users. Have you wondered why mobile apps are found in widespread adoption? It’s because they work as dedicated digital assistants for the users. A variety of pieces of information is collected to give custom responses to the end users. This is the information that is generated during customer usage. Each usage has interactions or commands that are being used with the apps. Because of the data, the apps are becoming smarter and their responses tend to become more accurate. In fact, it can leverage real-time data and location-based services to deliver an enhanced personalized experience. #2 Reduced app development time. Right from personal and professional lives, the roots of IoT and mobile apps have given its Midas touch like never before. IoT allows developers to complete building an app in much less time, saving them significantly on the efforts involved. It may quite interest you to know that with the help of IoT several innovative and more engaging features in the app. As the point says IoT in mobile app development can lead to higher efficiency and better utilization of resources. This integration will automate several processes offering a unique way to smarter homes and smarter cities. Mobile strategies powered by IoT can ensure to free up a good part of employee bandwidth. This is indeed a win-win situation where more attention be given to core tasks. For example, the remarkable results of this collaboration can be witnessed in the manufacturing and supply chain operations. #4 Modified and more efficient apps. Future of mobile apps will always be revolving around connected devices. Like it or not but in case of absence of connectivity, apps will lose the interest of users and hit a dead end. As a result, mobile app developers are striving to come up with future-proof apps. Smart devices are no longer a luxury, so think of something different to increase user adoption. #5 Strengthening data security measures. Using an app means it keeps on collecting ample of information regularly. Moreover, this is how it provides personalized responses and recommendations. At the same time, it also raises concern about user privacy and security of data. Many of you have this misconception that mobile apps pose a high likelihood of data breach. Unfortunately, attacks cannot be denied, but as a professional, you can definitely work on your defense. With the help of IoT systems, you can come up with an additional active layer of safety. In the end, data continues to stay protected- all thanks to data encryption and multiple entry points. How Are Mobile Apps Leveraging IoT? 1. Wearables — Bluetooth, Wifi used to connect devices like watches, eyeglasses and even bands to your mobile phones. With IoT any form of data, starting from information to videos, audios, images can be exchanged between two devices. 2. Healthcare — The urge for Home-based medical devices is on the rise. Thanks to mobile apps powered by the Internet of Things this is becoming a reality. Technically speaking, medical devices are connected to servers where professionals can receive health data from the patient via a mobile app. Further, this crucial data can be moved remotely to the relevant doctor. As a result, the need to visit the hospital for minor issues is substantially reduced. Managing chronic diseases, monitoring clinical conditions, assisted living, wellness monitoring and preventive measures are some of the common IoT solutions in healthcare. 3. Retail — RFID inventory tracking chips, Wi-Fi tracking system, and digital signage are all part of the tech systems now. In simple words, these sensors receive relevant data that are then transferred to mobile apps. Businesses can proactively into the customer’s needs depending on the time and place. IoT tech is about a decade into the digital revolution; businesses are still found struggling issues related to disruptive technologies. The extreme level of connectivity of devices creates concerns regarding security and privacy. Remember to put additional security measures and maximize response time and efficiency. A few factors to consider when it comes to IoT app development and security. #1 Adhere to license agreement — Make sure that each of your equipment is original or get it conformed to different license agreement strictly. Basically, businesses have to ensure that they are duly aware of these terms and adhere to them. #2 Connectivity — Of course, you are going to connect your devices to the internet, so don’t forget to consider the mode of connectivity. Whether it’s Bluetooth or Wi-Fi, traditional mobile network, make sure it’s safe to use. You’ll want to carve out a strategy to assign permissions. #3 Hardware Capabilities — Along with software, it is also essential to consider hardware capabilities with your enterprise. Large businesses these days can easily add different hardware capabilities, but the entire process can be quite pricey and complicated. #4 Follow all the programming protocols — Having different programming protocols in place is another crucial element when connecting different devices at the same time. In the case of iOS apps, the External Accessory framework allows the communication with external hardware which is connected to any iOS-based device via Apple Lightning, wirelessly using Bluetooth or 30-pin connector. The framework supports need to figure out which kinds of app that various IoT devices can access through its connected iOS devices. Considering all the pointers above into account, we can assume that businesses regardless of their size bound to provide innovative ideas and launch IoT mobile apps to carry out long-lasting engagement with their valuable customers. IoT is a massive change seeping into the technology world. Most industries will find valuable customer helps in wearables. High on the list is the healthcare industry’s high adoption of this technology. Businesses will need to cope with the latest trends now to gain experience so that they can move forward with all of the innovations to come.